Can I use my regular X mm wide angle lens instead of an X mm fisheye? I get this question quite often. People usually already have an 8 or 10mm wide-angle lens (on crop) or a 12 or 14mm wide-angle lens (on full frame) and, with all the talk about fisheye lenses, wonder if they can just use that to produce full 360×180° panoramas. The answer is: Of course you can, but you will need to take more images to cover the entire sphere. With both fisheye lenses, you can get away with as little as 4 images to cover everything — with the non-fisheyes you need a bare minimum of 12, but more like 16 shots to have captured everything. Click on the image here to see a quick visual comparison between the different lenses / images they produce. Pay particular attention to what is included and what is not included in the extreme corners. Lenses used for the comparison above: Peleng 8mm ƒ/3.5 fisheye and Sigma 10mm ƒ/2.8 fisheye on a 1.5x crop sensor, and a Sigma 12-24mm on full frame sensor (to simulate 8mm/10mm on crop). 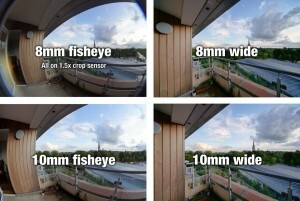 PS: A good comparison of what the different fisheye lenses look like on the different sensors sizes, check this page. Sir I use yashuhara 8mm fisheye lens and sony alpha 3500 camera . But when I stitch the pano with ptgui then the vertical blur line cames. What I do? Hi, thanks for all the tutorials and the information provided on your web page! 1. I would like to use my Sony A6000 to produce full 360×180° panoramas and I am hesitating between two lens: A) SAMYANG 8mm UMC F2.8 II or B) Lensbaby 5.8mm f / 3.5 Circular Fisheye. What do you think will allow me to do the panoramic with better quality and speed?¿Maybe you know a better lens option than this for Sony E? 2. For quick and cheap works (for small businesses on Google Maps) I’m thinking of using a Ricoh Theta camera, Sansung Gear 360 or similar … I tried the Ricoh but I was surprised by the poor quality of the image. Would you recommend a camera of this type to do quick and cheap jobs for small businesses? Of the available market options today, would you highlight any? 2. No, I would never to a business job with a one-shot-system. Current options all lack the quality – and also don’t really make you look like a professional. Florian hi. Thank you for all the useful information and tutorials. I would like to create 360/180 indoor panoramas (for architectural / interior design use). I’m using the IRIX 15 mm (has a field of view of 110 degrees diagonal) on my FF camera. I manage wee with the 360 but struggle with the 180… Do you have any suggestion for me what will be the best method to get the 180 ?